Setting goals are human nature. Without it, life becomes a series of chaotic events that you have no control over. Without goals, you are destined to float through your life, never accomplishing anything. To accomplish the goals, you set, it is vital to creating S.M.A.R.T goals. These are goals that are Specific, Measurable, Attainable, Relevant, and Timely. 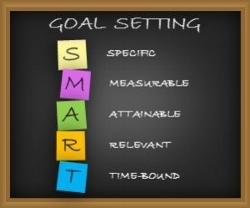 Setting S.M.A.R.T goals brings structure and manageability to the goals that you are trying to reach. They provide you with valid paths to help you achieve your biggest goals. They provide you with clear milestones and an assessment of the achievability of your goals. Setting goals that are specific will provide you with well-defined goals that will show you the direction you need head to succeed. You need to give yourself concrete goals, so you know exactly what you are working toward. You need to know who will be involved in helping you reach your goals, exactly what you want to accomplish when you are going to reach your goals, and how you are going to make this happen. Once you’ve established the who, what, when, and how you are going to accomplish your goals, you need to determine how you will gauge your progress. Making your goals measurable allows you to know when you’ve accomplished them. If you want to be successful in achieving your goals, you have to make them attainable. An attainable goal is one that you truly believe you will be able to reach and have the resources available to achieve them. To determine if the goals you’ve set are attainable, you have to ask yourself if you have all the resources to make it happen. It is important that when setting your goals, you make sure that you’re choosing goals that fit both you and your lifestyle. You don’t want to choose a goal out of guilt or because someone else thinks it’s something you should do. If you want to be successful in reaching your goals you want to pick something that is meaningful and relevant to you. It is crucial to set a deadline for accomplishing your goals. Setting deadlines makes it possible to pace yourself for reaching your goals. Having a completion date attached to each of your goals will help you stay on track. Setting S.M.A.R.T goals is a great way to ensure that you will find success in getting everything you want in life. Learn How to Achieve Your Goals Quickly.